How many times have your heard the following: "your gluts are not firing"? I bet many times. In the World of Strength and Conditioning and Physiotherapy everyone suffers from some form of seasonality/popularity of terminologies, myths and fallacies. We are currently living the era of "the gluts not firing" myth. Whatever the problem (low back pain, ankle instability, knee pain etc etc.) I bet you that if a physiotherapist or an S&C coach sees you…they will find out your "gluts are not firing". Few years ago it was all about something to do with your temporomandibular joint, now it is something to do with your gluts, next it will be something about your feet and so on. I am strongly convinced that the inclination to accept such terminologies and fallacies depends on some courses in which lecturers with dubious qualifications try to "re-invent" the wheel "branding" something esoteric and appealing presenting and packaging it very well. It is a bit like the fad diets. I have to say that this approach clearly works, because the Gluts fallacy (as I will refer to from now on) has clearly gone places as lots of patients/athletes have been "diagnosed" at least once with this problem. Let’s try to discuss this issue using some science. The gluteal muscles are the three muscles that make up the buttocks: the gluteus maximus, gluteus medius and gluteus minimus. The gluteus maximus is the largest of the gluteal muscles and one of the strongest muscles in the human body. It inserts at the iliotibial band and the gluteal tuberosity of the femur. Its action is to extend and outwardly rotate hip, and extend the trunk. 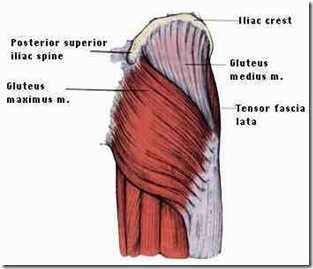 The primary function of the Gluteus Maximus is hip extension (moving the thigh to the rear). A very interesting article from Liebermann et al. (2006; J of Exp. Biol.) compared the form and function of the gluteus maximus in Humans, apes and non-human primates. In particular, the researchers were testing the hypothesis that the human gluteus maximus plays a more important role in running than walking. The results of the study showed that "[…] the gluteus maximus is mostly quiescent with low levels of activity during level and uphill walking, but increases substantially in activity and alters its timing with respect to speed during running. The major functions of the gluteus maximus during running are to control flexion of the trunk on the stance-side and to decelerate the swing leg; contractions of the stance-side gluteus maximus may also help to control flexion of the hip and to extend the thigh. Evidence for when the gluteus maximus became enlarged in human evolution is equivocal, but the muscle’s minimal functional role during walking supports the hypothesis that enlargement of the gluteus maximus was likely important in the evolution of hominid running capabilities." When comparing running on treadmill vs running on the ground, Bankoff and Boer (2007; Electrom. Clin. Neurophysiol.) concluded that running on treadmill showed the highest electromyographic (EMG) activity with the gluteus maximus always showing higher activity (root mean square -RMS) than the iliocostalis lumborum muscle. Rand and Ohtsuki (2000; Gait and Posture) studied lower limbs muscles with EMG during quick change in running directions. Fig. 4 from Rand and Ohtsuki (2000). Movements and EMG records of all conditions. CON, control straight running condition; STO, visual stimulus condition-open maneuver; STC, visual stimulus condition-cross maneuver; SFO, self-initiated condition-open maneuver; SFC, self-initiated condition-cross maneuver; STF, control stop condition. The subjects changed running direction in response to a stimulus for STO and STC, and changed direction in a self-initiated manner for SFO and SFC. The subjects stopped running in response to a stimulus for STF. The upper part of each plot shows front views from TO of step 3 to the FS of step 5. The lower part shows the examples of raw EMG records of VM, G, GM [Gluteus Medius], and SAR of the right lower extremity (see the text for abbreviations). The arrowhead in the figures (STO, STC, and STF) refers to a presentation of the stimulus. 2FS and 4FS present foot strike of step 2 and foot strike of step 4, respectively. They concluded that the gluteus medius was mainly involved in modifying foot trajectory of the leading leg during the open maneuver. EMG analysis of sprinting revealed that gluteus maximus showed similar activities to lateral and medial hamstrings reaching with peak levels of EMG during foot-strike (Jonhagen et al., 1996; Scand J Med Sci Sport). The EMG activity during running is so high that many times reaches average values higher than the ones measured during a maximal voluntary contraction (Kyrolainen et al., 2005; J Sports Sci). In particular when running speed is high. From this brief analysis of the current literature, it seems clear that the gluteal muscles have an important role in stabilising the hip during running. They are in fact always active during foot strike, and they all contract at once. Most of all, the levels of EMG activity recorded are so high that they can exceed maximal voluntary contraction measured in isometric modality on a dynamometer. During normal stance and walking the EMG activity of gluteal muscles is relatively small, but it is enough to maintain a stable posture. Just like all the muscles responsible for maintaining the spine stable and the muscles of the lower limbs able to keep you standing. Without some levels of activation of gluteal muscles nobody is capable of standing still. So, how about gluts not firing…. Unless the patient/athlete under observation had a spinal cord injury and/or is affected by any neurodegenerative disease, it is physiologically impossible for the gluteal muscles not to be active (or not to "fire"…if you allow me the use of current jargon). This can be easily tested. in fact a lack of muscle activation in the gluteal muscles during running could be easily identified. If in fact the gluteal muscles are not active during the foot strike, your patient/athlete is going to collapse on the floor. "Gluts not firing" is therefore an absolute non-sense. How about abnormal muscle recruitment timing patterns? For example, are the gluteal muscles being recruited at the right time and for an appropriate duration and intensity? This is a slightly different question. It may be in fact possible that some activity patterns in the affected/injured side might be slightly different in the timing and onset of muscle activation and in the amplitude of the EMG signal. But what defines pathology? EMG analyses can be conducted to compare for example the "normal" side to the side affected by the injury. However many times the observation "your gluts are not firing" is not matched by electromyographic measurements. Biomechanical analyses can also be performed to study hip motion, but even here, the "normal" running gait of the patient/athlete should be determined before coming to conclusions just because the hips are moving up and down. Hip motion is in fact affected also by foot placement and knee control. So, an abnormal hip pattern might have nothing to do with activation patterns of gluteal muscles. In the last two paragraphs I mentioned "abnormal" few times. It is in fact absolutely necessary for everyone (physiotherapists and strength and conditioning coaches) to understand what a normal movement pattern looks like before making a diagnosis. EMG analysis and biomechanical analyses of running gait should be part of a normal screening pattern for elite athletes in order to have some baseline information of their normal movement patterns. When injuries occur, it is then possible to compare such recordings with injury-free data to be able to identify any anomalies in movement patterns. Just like every discipline I strongly believe physiotherapy and strength and conditioning should move towards a more "evidence-based" approach. Before declaring gluteal muscles dead, we should first make sure we know how they "behave" when they are alive! This is an interesting question. I don’t know where and when this started, but I noticed this is now accepted jargon. I would hope that who made this concept popular meant some alterations in motor units recruitment patterns. However, I am more interested in finding out when and how a Physiotherapist and/or and S&C coach defines an alteration in gluteal muscles. The concept was proposed by Vladamir Janda – the cross pelvic syndrome where those with a history of low back pain displayed characteristic patterns of what he referred to as “weak”, overactive muscles (Mcgill, 2006). Personally I struggle with these concepts – how can a muscle be “overactive”? Cross pelvic syndrome inclues a weak gluteal complex with tight or overative hamstrings and or hip flexors. McGill uses the term “gluteal amnesia.” Whilst performing different function tests e.g., squat / hipo extension movements participants use their back extensors and hamstrings and it appears their glutes do not fucntion, hence the term glute amnesia. Specific gluteal reprogramming is warranted for those who have this problem. According to Mike Boyle Sahrmann believes most anterior hip pain is also the result of poor glute function and the resultant synergistic dominance of the hamstrings. Sahrmann discusses the simple biomechanical explanation by citing the lower insertion point of the hamstrings on the femur. If the hamstrings are consistently called upon to be the primary hip extensor, the result will be anterior hip pain in addition to hamstring strains. The anterior hip pain is a result of the poor angle of pull of the hamstrings when used as a hip extensor.Hope that helpsJamie Carruthersps great blog!! Thank you for your contribution Jamie. I will read more about this and hopefully write something else on this fascinating issue. My best advice is to try to ask your physio and osteopath what exactly is wrong. It seems to me that whatever you are doing is not working. Furthermore, if still in pain I would try to to do an MRI to make sure there is no “structural” issue in your spine. I tracked down (I think) the reference that Jamie mentioned — Stuart McGill — who has a book out “Low Back Disorders: Evidenced-Based Prevention and Rehabilitation” — he’s the one credited with the concept of “gluteal amnesia” that Jamie mentions. I, too, have been diagnosed with problems in muscle recruitment patterns and so would love to find a source that could provide more information (I haven’t yet had great success with my local physical therapists) — I wonder if this book would be a good option? Or, if you see it as being responsible for this sloppy, fad diagnosis? I think this is an argument of semantics. Glutes not firing has become a short-form for glutes not working optimally to support the pelvis and lumbar spine. Obviously the glutes are firing to some extent (it is impossible for them not to fire) but at what level should they be firing for optimal function? Also, in what sequence should they be firing within the kinetic chain? I think that is the important question and I'm not sure there is a definitive answer to that yet, suffice to say that in my experience and the experience of many other great trainers, coaches and therapists (there is research to support this, a large portion of which done by Stuart McGill) the glutes are the largest muscle within that chain and should be firing more predominantly than the hamstrings and especially the low back extensors. I can't tell you how many people I see that initiate hip extension movements with their lumbar erectors and not the hips.The problem with many rehab environments is that you go in, the therapist/coach/trainer gives you a bunch of foo foo exercises that you go away and do for 2 months, 4 months, or a year and typically poorly. You did not develop a full understanding of the exercise or the problem in the first place because your insurance only covered 5 sessions or you did not feel you were gaining any benefit from the therapy in the first place. Poor glute function can be brought on by a severe anterior tilt (in relation to the iliac crest) brought on by the tight hip flexors I would guess 80% of the population suffers from because most of us in developed countries sit 8-12 hours a day or more (something that was not a problem even 100 years ago). I don't need a study to show me that a severe lordosis with anterior tilt is a problem.Again the focus should be on developing 'optimal' function and 'optimal' function can be different for everyone. Thank you for your comments Darren. It is clear that there is still confusion about the terminology. It is not only a problem of semantics. I believe there is the need to identify the problem (if there is one) and then provide a solution. If the problem is an abnormal activation of the glutei muscles (and we need to define if abnormal is a reduced activity or an alteration of the timing or both), then how do we diagnose it scientifically? And how we solve it as well (possibly showing the proofs that such approach has worked). I don't agree with you that "the glutes are the largest muscle within that chain and should be firing more predominantly than the hamstrings and especially the low back extensor". In fact, if you read Jonhagen et al. (Scandinavian journal of sports sciences), you will see that they have shown that lateral and medial hamstrings and gluteus maximus showed similar activities with peak levels of EMG during footstrike. Similar data were available from Simonsen et al. (1985-Eur J Appl Physiol). Great, thought provoking article! And I believe Darren has an nailed it. EMG activity does not equal amount of force! The cross-sectional area of the muscle has to also be considered when evaluating the contribution of a given muscle to the actual movement that is occuring. Bazza,I agree on the need for more research. Most of all nobody seems to provide evidence of a clear diagnosis to evidence such issue (a part from an extreme situation where the patient can't clearly walk normally). So how can you solve a problem you cannot identify?Oliveri,EMG amplitude indicates the amount of motor units active under the area of detection of the EMG electrodes. So while it is true that the EMG signal is not a true reflection of the activity of all the motor units in a given muscle. Classical work from BIgland and Ritchie (1981) suggested a linear relationship between the iEMG (integral of the EMG signal) and isometric force in some muscle groups, Vrendenbregt and Rau (1973) suggested a non-linear relationship exists. Probably a consensus of opinion i that EMG and force are “linear” under isometric condition and non-linear under isotonic conditions (Weir et al., 1992. Independently from the model and muscle groups, generally speaking EMG activity is a good predictor of the level of force produced by the muscle being measured. Hence the reason for using EMG not only as a research tool but also as a diagnostic tool. WHat are we talking about?Saying the being pro active and offering solution.Are we looking into the war of scientist vs physical therapist?What point are you trying to make?You write an article and you don't know a dime on the functional word; if you don't know Mc gill and Janda, you don't know double cross syndrom, postural assessment, FMS….You need to dig into neuro physiology and functional training a little bit more before sharing your though. I would have expect more.It has been study for year and have produced many results.Tensegrity model in the kinetic chain is a concept that has been accepted (postulat), yet it will be very difficult to put number behind.Looking into science we may see a lot of "u-turn" in the past decade starting with the fascias. It was only an envelop when i went to school and now some name it our 6th sens, the sens of movement as the french physiologist Berthoz wrote. As a scientist you may go against anything you haven't prove yet…A contrario, you accept stretching effect on muscle fibers recrutement.You want prove of faulty pattern with mechanical dysfunction born from improper neurological recrutement? Well get a portable stabilometry insole link to EMG. Evaluate pre exercise, post stretching, post analytic concentric and eccentric drills, and functional drills. FInally testing SJ, CMJ and DJ with an Optojump should give you the kind of data overtime you like.I read one of your interview saying you now are far away from the field. this post is a clear evidence of it.I will be more than happy to point to some great article and studies.Remember, society carry several miss used words or idiomatics.Now if the goal of this post was to mention we should educate the mass better, you are right but how we scientist will talk then? Arnaud,Why don't you go ahead an post a bibliography of the studies you imply? I am amazed about the interest this old post is generating. Clearly this seems to be an issue still. It is sad that some people are trying to turn it into some sort of almost religious discussion. But there you go…let's try to answer Arnaud which clearly had his blood pressure affected by the blog.1) The aim of the article was to discuss some jargon used in many fields and try to make some sense of it from a scientific standpoint.2) I am not trying to cause any war between any profession. I am just discussing an argument using science3)The point I am trying to make is that to date, in the scientific literature, there is no clear evidence of how to diagnose and solve "the gluts not firing" syndrome (assuming it exists)4)I do know Janda and Mc Gill but I like to read scientific papers before or after books. And when I do a simple keyword search Janda and Gluteus on Pubmed, only two articles appear. (You can see for yourself here http://www.ncbi.nlm.nih.gov/pubmed?term=Janda%20gluteus)In none of them Janda is first or last author. In the paper on SPINE (1976) the authors investigated whether gluteal muscles could be activated more effectively by stimulating the proprioceptive mechanism during walking (using a shoe).Electromyographic recordings of gluteus maximus and medius in 15 healthy subjects were made during barefoot and balance shoes walking before and after 1 week of facilitation. Significant increases (P < 0.0002) in gluteal activity and significant decreases (P < 0.01) in time to 75% maximum contraction, demonstrated the value of sensorimotor elicitation of subconscious and automatic responses in muscles often weakened in back pain sufferers. I don't have the paper with me here so don't remember if there was a placebo intervention. Fact is that this paper does not show any gluteus imbalance issue. The other paper is interesting.AbstractThe likely influence of a localised injury in a distal joint on the function of proximal muscles is an important consideration in assessment and treatment of musculoskeletal injuries. However, little experimental evidence in humans exists in this area. Accordingly, a controlled study was carried out, in which the function of muscles at the hip was compared between subjects who had suffered previous severe unilateral ankle sprain and matched control subjects. The pattern of activation of the gluteus maximus, the hamstring muscles and the ipsilateral and contralateral erector spinae muscles was monitored through the use of surface electromyography during hip extension from prone lying. Analyses revealed that the pattern of muscle activation in subjects with previous injury differed markedly from normal control subjects, and that changes appeared to occur on both the uninjured and the injured sides of the body. A significant difference between the two groups was the delay in onset of activation of the gluteus maximus in previously injured subjects. The existence of remote changes in muscle function following injury found in this study emphasise the importance of extending assessment beyond the side and site of injury.The interesting bit is that the "changes" were observed also on the non injured side and it was not the total EMG amplitude but rather the delayed onset of activation. So again, not sure this proves the gluts not firing hypothesis.I am sorry but the following sentences are not clear to me as I am not sure what you are trying to say.I don't remember writing something about stretching effects on motor unit recruitment.Again I cannot quite understand what your point is, but I do welcome your willingness to share with everyone scientific information on the topic.If you have some meaningful articles we can all learn from, it would be great if you could link them here. Thanks again for reading the blog. Ok I am a bit late to comment as I only just found the blog, but I too am amazed with how much attention there terms get. Could it be just weakness instead of not firing? Why is it that some people, whilst doing the floor hip thrusts feel their hamstrings hurting and don't feel anything in their gluteus since they are extending their hips? Doesn't this tell us something? Also, these muscles don't really work alone, which muscle is (I know I know), but since they are not working alone if they are weak they could be creating compensation (could this be overactivity?) for the lumbar spine muscles or the hamstrings right?So to conclude don't you think the aim is to train muscles so that to minimise muscle imbalances?I do agree however that misfiring is so hard to determine and therefore is as much of a trend as the term core or functional is. I recently found this blog from a Craig Liebenson link so you may expect more of the same comments. I like a challenge to my normal way of thinking and I was ready to have my world rocked by the post, but wasn't.Referencing the original research is always a good idea. In the case of Janda, he published 16 books and 200 papers on muscle function. It is safe to assume that many of these are probably in Czech and not readily translated on PubMed. I strongly recommend you familiarize yourself with "Assessment and Treatment of Muscle Imbalance" by Page, Frank, Lardner. It has many of the referenced articles you seek and can discover the groundwork for the theories you try to dispel. Personally, I feel there that using these and other movement patterns, you can identify a persons major weakness and begin a focused stabilization pattern allowing for a better movement pattern to occur.In terms of delayed onset of activation, look at the timing during gait. The stability needs to come from somewhere. For Jamie, not only can a muscle become overactive but it can also be weak at the same time. Small or large portions of a muscle can become engage in an effort to try to stabilize a weak area. Let's pull out another classic example of weak abs leading to back pain. The spine needs to be stable in 3 dimensions. If the anterior aspect is weakened, the back muscles try to now take over all he loading support in the spine. In some cases the muscle is overactive due to centrally mediated signals (the CNS telling it to contract) and in some cases they are locally mediated (think trigger point due to open muscle channels- ACh,sarcoplasmic reticulum ). It becomes weak because it is fatigued from trying to fire all the time. It blew my mind the first time it was explained to me too. Dear Doug,thanks for your comments. First of all I would like to state that I am not trying to dispel theories, I am trying to understand if they make any sense scientifically with the available knowledge in peer reviewed literature (and yes,scientific literature on high impact factor journals is in English).So my point is to discuss terminology with the science I know and I can access so I expect this to be limited and was hoping to have some interesting contributions from readers like yourself.So thanks for indicating the book, I will look at it. However, more interestingly I read the tribute on Spine http://www.jandaapproach.com/wp-content/uploads/2012/11/morris2006.pdf and learnt more about Prof Janda and what he did. However, that still does not explain the "gluts not firing" jargon used by many with any scientific work to support this.In fact, acording to the tribute "His publishedpapers varied greatly in their focus: from pediatricsto geriatrics, in addition to the effects of pediatricconditions on the adult, from the latest in neurodiagnostictesting to the latest on rehabilitation and manualmedicine standards,from postura to neurologic disorders, and from ankle conditions to obscurefacial pain. In addition to publishing several texts inCzech, Janda subsequently published his books in Germanand English. "I went to look at the ones I could get access to and none of them presents experimental evidence of "gluts not firing" hypothesis.So, my question still remains and please do point us to actual experiments in which this theory was tested as we all want to know more. The "Glute" theory came from a study Janda was doing to try to evaluate EMG studies on muscle activation. He noticed muscles firing that should not be firing with certain movements. Specifically he noticed an increase in pelvic tilt in subjects without good gluteus maximus activation. This line of thinking was extrapolated in his thesis in 1964 "Movement patterns in pelvic and thigh region with special reference to pathogenesis of vertebrongenic disturbances". Unfortunately, this is in Czech. You will however find many relevant papers is you change your PubMed search to "hip extension test EMG". My search yielded 84 articles. I believe you will find the answers you seek in these studies.The "Glutes not firing" is not that they are completely inactive but it may simply be they are firing too late. Not just the force of contraction but also the speed of contraction. On a similar note, it may also involve the speed of relaxation on the opposite side. See Stuart McGills work on super stiffness for more on that. Thanks for your comments again Doug.I did the same keyword search and many articles of course have nothing to do with the gluts not firing theory.Having a quick scan I can't find anything meaningful, but will look for it and will try to add to the blog. Fatigue does not seem to change hip kinematics as indicated here http://www.ncbi.nlm.nih.gov/pubmed/22840731This study instead http://www.ncbi.nlm.nih.gov/pubmed/22464201suggests that . Results showed that increased activity of the hip flexor (tensor fasciae latae) relative to that of hip extensors (gluteus maximus and semitendinosus) was significantly associated with increased anterior pelvic tilt during hip extension (r=0.52). Increased anterior pelvic tilt was also significantly related to the delayed onset timing of the contralateral and ipsilateral multifidus (r=0.57, r=0.53) and contralateral erector spinae (r=0.63). Additionally, the decrease of the gluteus maximus activity relative to the semitendinosus was significantly related to increased muscle activity of the ipsilateral erector spinae (r=-0.57). These results indicate that imbalance between the agonist and antagonist hip muscles and delayed trunk muscle onset would increase motion in the lumbopelvic region. However all assessment was performed while the person was prone. So not clear what that means when they are standing or running.What I am trying to understand is if the gluts "are firing too late" how late is considered pathological and what is normal? I believe the idea of delayed firing is relatively new. I do not think any standards have been developed yet (assuming they exist). Here is a study I found investigating shoulder muscle latency. http://www.ncbi.nlm.nih.gov/pubmed/23137918Since the hip and shoulder are similar, we may presume some of the characteristics will be similar.There is this study which found no correlation between pain and non-pain patients. It did also demonstrate a latency with both groups in gmax firing relative to semimembranosous. http://www.ncbi.nlm.nih.gov/pubmed/20949236I'll keep looking but it is interesting that there is not a lot of actual data immediately available to the US audience. Let's ask Dr. Liebenson, surely he will point us in the right direction. This has been a fun exercise to challenge my beliefs. Almost like having to go back to the bible to look up a meaningful verse. Are we really not supposed to eat shellfish? SINNERS!In your post, you make several assumptions. 1. Perhaps the terminology that is used is inadequate. Maybe it should be the glutes are not firing in an appropriate sequencing pattern as you suggest. I agree with that.2.' "your gluts are not firing" is not matched by electromyographic measurements ': This question has been answered by a recent study http://www.ncbi.nlm.nih.gov/pubmed/22877831 and http://www.ncbi.nlm.nih.gov/pubmed/10638873I used "gluteus maximus low back pain"3. It may not be practical to screen all athletes with an EMG and movement screening tests can provide valuable information. As you indicated, how can you best determine the baseline running test is optimal. The athlete may currently be pain free but that does not mean they are working most efficiently or with an ideal pattern. Many high level athletes will be working outside a "normal" pattern anyway because of their sport. If you can break out individual movement patterns, you can get a better sense of what each component is adding to the motion. A trained eye is able to pick out these flaws in a running athlete. Isolation tests can confirm these findings and train the clinician/coach to see them in a regular movement pattern.4. EMG activity with movement was greater that MVC: http://www.ncbi.nlm.nih.gov/pubmed/233120685. ' Hip motion is in fact affected also by foot placement and knee control. So, an abnormal hip pattern might have nothing to do with activation patterns of gluteal muscles' : Absolutely agree with this statement. Gluteals are just a part of the equation. A full examination of the movement pattern is in order. The gluteals appear to be weak but is it because the muscle itself is weak or the neurological control is lacking. If the neurological control is lacking, is this due to a motor stability programming issue (bad information coming from the body (poor proprioception, SIJ joint pain etc) or simply improperly learned behavior.Good thought provoking article and I like the way you were able crowdsource your research (ie have me go look it up for you…haha). Good stuff. Keep it coming. I agree with Darren with regards to the debate being partially about semantics. For many Practitioners using the term “Glutes not Firing” is not meant in the literal sense but simply to state that the Glutes are not functioning optimally and that a given athlete would benefit from improvement in Glute strength/activation. Most are not ignorant enough to try to claim that the Glutes are not firing at all, as we know this to be bogus. I thought this may also be of interest to the post…….A recent systematic review (Barton et al. 2013) found moderate to strong evidence indicating delayed and shorter periods of activation in the gluteus medius during stair negotiation in PFPS (Patellofemoral pain syndrome) sufferers. It is theorised that this delayed and shorter activation period results in a lack of hip control in the frontal and transverse planes leading to increased stress on the PFJ (Patellofemoral Joint) and subsequent PFPS. Whether or not impaired Gluteal function is a result of PFPS or PFPS leads to impaired Gluteal function is debatable. I therefore agree that Gluteals are just part of the equation and a full screening would help to address those with impaired Gluteal function and in relation to the above example those most likely to suffer from PFPS. I thought this may also be of interest to the post…….A recent systematic review (Barton et al. 2012) found moderate to strong evidence indicating delayed and shorter periods of activation in the gluteus medius during stair negotiation in PFPS (Patellofemoral pain syndrome) sufferers. It is theorised that this delayed and shorter activation period results in a lack of hip control in the frontal and transverse planes leading to increased stress on the PFJ (HPatellofemoral Joint) and subsequent PFPS. Whether or not impaired Glute function is a result of PFPS or PFPS leads to impaired glute function is debatable. I agree therefore that a full screening is needed for a more evidence based practice. A Good starting point could be the measurement of Gluteal strength. Prins and Wurff (2009) found reductions in abduction, external rotation and extension of the leg suffering from PFPS. Fascinating thread here, scientists blood pressures certainly raised here hehe (Arnaud) and some fine delicate unfriendly undertones as well…might I suggest everyone have a read the paper: the myth of core stability by Eyal Lederman. Thanks to all for your insights!